This half-to-full mini card adapter is a converter tool for PCI-minicard interface. This module allows you to use your half mini card in the full mini card slot. It includes the SIM holder on the back side of the unit to allow for use with a SIM. It's especially designed to save valuable labor and time in the production environment. 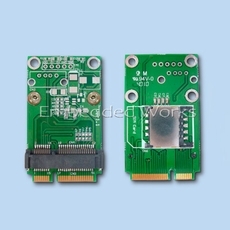 Both the m-PCIe channels and the USB signals are used in the this adapter.